Mushroom, squash, and artichokes fill these mini main-dish casseroles. In a 4-quart Dutch oven, combine pheasant or chicken, 3 cups water, onion, celery, bay leaves, peppercorns, marjoram, salt and sage. Bring to boiling; reduce heat. Simmer, covered, until poultry is tender (about 1-1/4 hours for pheasant or 1 hour for chicken). Remove poultry from broth. Skim fat from broth. Discard bay leaves. Strain broth, reserving 1-3/4 cups (reserve an additional 3/4 cup if not using wine); stir in wine or reserved broth. When poultry is cool enough to handle, remove skin and bones and discard. Chop poultry. Set aside. 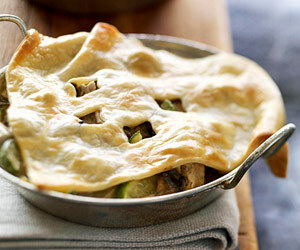 Let piecrusts stand at room temperature for 15 minutes. Unroll piecrusts. On a lightly floured surface, roll each to a 14-inch circle. Using a 14-ounce au gratin dish or an individual casserole as a guide, cut out 6 circles or ovals measuring 1 inch larger than the top of the dish. Make slits or tiny cutouts in the piecrust circles or ovals. (To make decorative cutouts, use small hors d'oeuvre cutters.) Roll pastry scraps to have enough pastry to cover all six dishes. Set aside. For filling: Transfer broth mixture to a large saucepan. Bring to boiling; reduce heat. Simmer, covered, for 5 minutes. Meanwhile, in a medium bowl, combine whipping cream, flour, and egg yolks. Gradually stir about 1 cup of the hot broth mixture into the egg yolk mixture, then return egg yolk mixture to the remaining hot broth mixture. Cook, stirring constantly, until mixture is thickened and bubbly. Stir in chopped poultry, mushrooms, yellow squash and artichokes. (The mixture will become more saucy after baking.) Divide the filling among six 14-ounce au gratin dishes or individual casseroles. Bake in a 450 degree F oven about 15 minutes or until the edges of the piecrust are lightly browned and the centers are golden brown. Let stand for 10 minutes before serving. Makes 6 main-dish servings. Quicker Version: Use one 14-ounce can chicken broth and 3 cups of cooked chicken in place of the homemade stock and cooked pheasant or chicken.